Steve Llano takes a selfie that is photobombed by several teams in the Rimrock Classic. 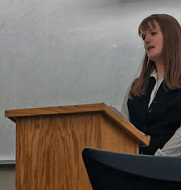 For the first time in its history, the Rocky Mountain College debate team placed second in the Rimrock Classic Debate Tournament September 14. The pair of David Fejeran, a sophomore history and education major, and Holly Todd, a senior business and communications major, broke into the final round to place second overall. 2014 marks the first year an RMC team has placed in the final round of this tournament. While at RMC, Llano joined with coaches from other colleges to teach debate. He gave lectures to novice debaters about how a debate round works and what each person needs to do in the round. After receiving lectures on how debates are formed, where to find good research and how to deal with opposing arguments, debaters were sent into rounds to put their new knowledge to the test. The RMC debate program is run by Shelby Jo Long-Hammond, an Associate Professor of Communications Studies. She believes that debate teaches more than just how to speak well or argue; it teaches how to think critically. In the nine years that Long-Hammond has run the program, RMC debaters have argued their way across the country and internationally, including in Slovenia and Ireland. These trips expose students to new cultures and debate styles. They give students a hands-on approach to cultural understanding. The debate team has tourney plans this year that include a trip to Greece in late October. They also plan on attending tournaments in Denver, Calgary, and Powell, Wyo., this year in which they potentially may debate against hundreds of schools. To fund all of these argumentative expeditions, the team will be hosting a Trivia Tournament in November and a public debate and fundraiser in Roundup, Mont. The team also plans to continue mentoring fellow debate students at tribal colleges across Montana. Holly Todd stands as she delivers one of the speeches that led to her team’s second-place victory. This entry was posted in Issue 8 and tagged main. Bookmark the permalink.